It's almost getting closer to the release of the latest Indiana Jones movie with Harrison Ford and Paramount continues to increase the buzz with their latest release of the Adventures of Young Indiana Jones Volume 2 which screened in Australia during the early 1990's. 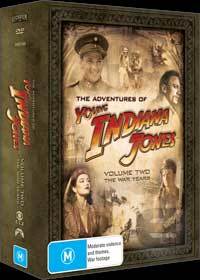 Unlike the previous volume which focused on a younger Indiana, this box set features Indy as a late teenager who volunteers to serve the Belgian and travels around the glove from Africa to Europe. Once again Indiana Jones meets a variety of historical people that almost makes this like a history lesson with a healthy dose of George Lucas action. He fights at the Somme and at Verdun where he is captured and imprisoned with Charles de Gaulle. He is cured of malaria by Albert Schweitzer, shot down and captured by the Red Baron. Indy meets up with Robert Graves and Siegfried Sassoon and falls in love with Mata Hari. This set packs in the action while also showing all the concepts of war, from being on the front lines, to people's various philosophies about war, and all those who got caught in the middle and the effects it had on them. The set also contains a healthy dose of special features with some interesting documentaries that uses real world historians and scholars which are extremely innovative and quite fascinating. I thoroughly enjoyed The Young Indiana Jones Chronicles Volume 2 and I cannot wait until the final volume which will complete this awesome series that can be watched by anyone, whether you're a history buff or an Indiana Jones fans, there is something for everyone. The Russian Revolution: All Power to the Soviets!